Discussion in 'WW2 Militaria' started by AB64, Dec 13, 2012. At the moment there are 1361 individual books - I managed to miss one in uploading and have another 3 just arrived with more on the way that I will add (hopefully I'll keep the folder up to date). They cover from the 1880's to the 1950's and include Army, Navy, Air Force of Britain, Canada, Australia, New Zealand, South Africa, Poland and a number of other countries serving with the British forces. Feel free to have a browse if you see any in there that are of particular interest I can scan the rest of the book and add any extra info I have on the individual - if you can add any more information to any of them I'd be happy to hear it. If you have any unit you are particularly interested in just ask and I can try dig out my file numbers relating to it (if I have any I know are related to the unit) and post them to make them easier to find. I hope these are of some interest. dbf and von Poop like this. One can only be impressed at the amount of work you have put in to your most interesting hobby. How did you get started on this fascinating piece of research and where on earth did you find the individual items ? I think it was seeing my great uncles medals when I used to visit my Grandad - Dan was killed in 1915 at Loos and my Grandad had them right beside the seat he was always in - they fascinated me and I think thats what started the interest in militaria - when my Dad (National Service in the Pay Corps - not glamourous but a vital corps I'm sure you'll agree) gave me his few bits which included his paybook that started my interest in them and when I started going to Militaria shows I started picking them up here and there - when I started on Ebay that really openend things up and its on there I get most of them. As I've mentioned on another thread I consider these to be have a very direct link to the service person as they were carried with them constantly (hence why so many were later replacements as they wore out) so were with them in and out of action - most militaria (uniforms and equipment) cant be linked to an individual the same way whereas medals can sometimes be linked but in the main were only issued after the War was over - plus its easier to store paperwork. I'm also keen to share whats in my collection to help others with there research, hence why i'm trying to make these accesible. Sorry If I've prattled on a bit. Just seen your excellent website and noted you have the AB64 for a old schoolmate, having both joined the local but newly formed TA Battalion of The Royal Scots in Peebles in May 1939. Jimmy Swan I were just 18. Have sent an email, even if it is 0430 hrs! Alistair: In my spluttering excitement got the spelling wrong . . . Need a dram! I've sent a reply at 6.30 - as mentioned in that Jim was a friend for a short while, I forgot to mention I dont actually own Jims book, he lent it to me and I scanned it for my website (the website at A guide to the Army Book 64 – Soldiers Service and Pay Book has a few limited examples, but the album at http://s106.photobucket.com/albums/m253 ... e%20books/ has all my books) Jims AB64 and other ephemera ended up with his wifes niece. I'm glad you've found it of interest. After getting out of the army back in 1947 I completed pasting memorabilia into my Army Album. By this time I had done with my pay book and so I scanned through it to see if there was anything there that I felt should go in the book. All I apparently found of interest was pasted into Page 85 where you can see my jabs and my medal entitlement. What an amazing collection. It must have taken the best part of a life time to put this together. And it is so accessible. Thankyou very much for making it available to browse. Fantastic collection Al. Really is top class. Desperately hoping you may have collected my late Grandfather`s paybook I eagerly looked through them all, but sadly you don`t have it. I have all his medals, his service record and even his RA badges and uniform stripes, but his paybook has never come to light in the family. This would have told me so much more about his service but what happened to it after he died in Burma will probably remain a mystery. I wonder how many more have searched your collection in a similar vain? Pinning this thread - great stuff. Looking forward to the full transcriptions. Do you mind if I add your site to our links? Thanks for all the comments - to make it easier to find books of interest I was going to attach my master list, but its an .odt file so wont attach, I'll try change it to .xls on Monday at work and attach it. 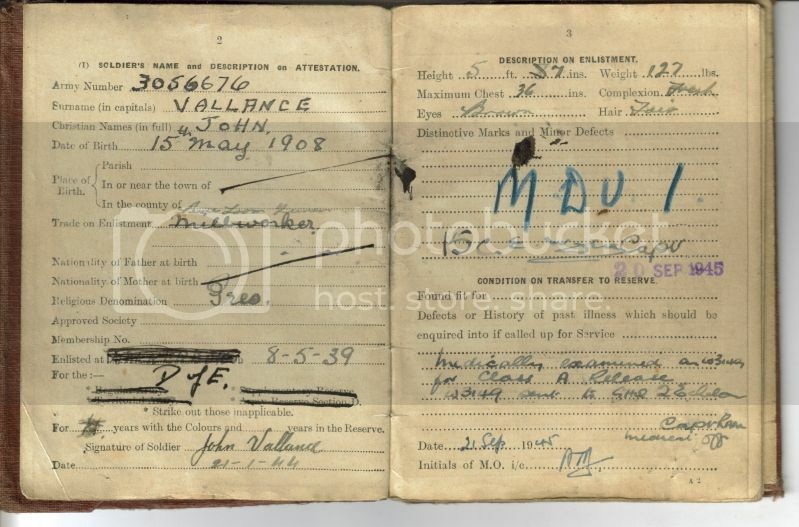 From chatting with Mr Brown we found another old friend of his on the list, John Vallance http://i106.photobucket.com/albums/m253/ab64/all%20service%20books/963vallance.jpg who served with him in 8th Royal Scots and was from nearby. Von Poop, I'm happy for you to add a link, I'm not sure what to do about adding more pages, scanning the ones that are there took ages and I'm not sure how to add extra pages without making it too big a folder, splitting it down by individual would work but would them mean lots of up and down through folders to browse (thoughts and suggestions welcome). Do you have a "postable" index of names/units? Brilliant work Alister. It was your collection that inspired me to do something along the same lines. Added .odt (Open Document) to the allowed attachments here. Hopefully this has the .odt version and also a .doc version - I cant promise all the details in this are spot on, I know when I've looked before I found odd mistakes in numbers, plus I havent been fully consistent with unit names things like mixing RA and Royal Artillery but its easier than trawling through all the books (although just browsing is hopefully of interest to some). Five-Five and von Poop like this. I have to say: Well done, mate. You've gone & added another searchable resource to the historical heap - efforts definitely to be applauded. I've been back through the photobucket folder and added a few books that I missed first time and also tidied up a couple where I had misnamed them. I have a few more books to add (hopefully tomorrow). Another 11 books added to the list and also the photobucket file.